If there's something hubby and I both enjoy (we of infamously different tastebuds), it's a good Cantonese style crispy roast chicken. This one above is from Shang Palace - S$24 for half bird, and what a plump, meaty one it is. Nicely moist and just very lightly seasoned. The dipping salt is curry coloured and speckled with all kinds of herbs and spices. A hint of the woodsy. I think I still prefer the chicken with the savoury taucheo-chili sauce, which is really good here. 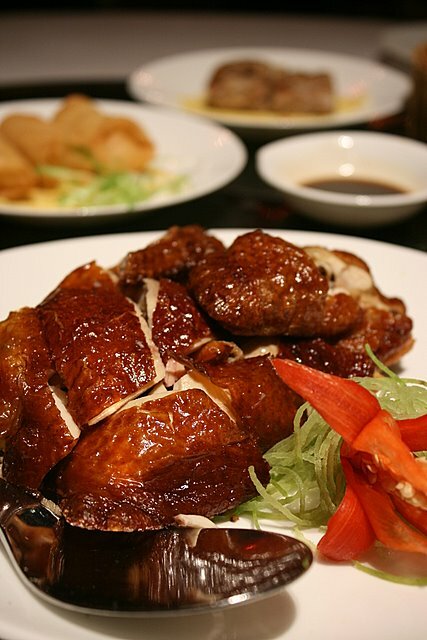 I hear Crystal Jade Palace at Ngee Ann City also does a good version of the crispy roast chicken. Yet to try that. Anyone have a favourite place for this dish? but I think only his chicken is good ... other food seems to be a bit salty for me. Chef Chan's Roast Chicken is the best I've tasted. I actually like the chicken when the skin is crispy with little or no fats underneath (i dunno how do they do that) and the meat tender & plump. does this dish comes with keropok? some places comes with that. holy...that looks good. i dont think i've ever had canto-style roast chicken. but i love roast duck. how do the two compare?